In 1960, soon after the life story of American golfing legend, Ben Hogan, was portrayed in the movie, Follow the Sun, Mike Florance and his committee announced the formation of the ‘Follow the Sun’ Nomads Golf Club under the aegis of the National War Memorial Health Foundation. The lapel badge was similar to the Nomads badge we have now hanging from the name bar, but it consisted of a bell alone with a scroll at the top edge, with the legends Follow the Sun and Onthou 1939-1945 immediately above the bell. The background colours were yellow (sun) in the upper half and green (grass) in the lower half. The choice of the bell was prompted by a line from the Meditations of John Donne – For Whom the Bell Tolls – symbolising remembrance of those who had lost their lives in World War II. This is now our creed. 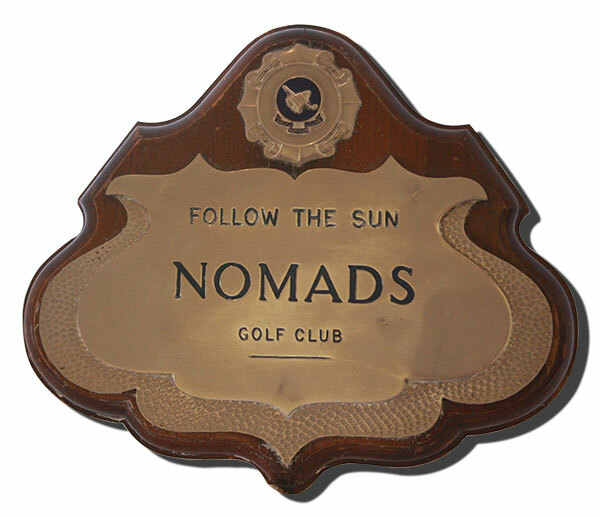 The ‘Follow the Sun’ Nomads Golf Club came into being officially in April 1960 and this, our founding club, became known as Transvaal Nomads upon the formation of the other clubs around the country. 106 Founder Members attended the first monthly meeting scheduled for the first Saturday in April at the Glendower Golf Club. The meeting itself was washed out, but what a party it was! Rain also partially disrupted the second attempt at Parkview in May so it was June before the first complete official Nomads meeting took place, this time at Irene Country Club. The success of the new club was immediate and membership soon rose to 200 when it was closed because it was impossible to accommodate all those who wanted to play. During 1962 it was decided that the funds raised would no longer be donated solely to the National War Fund, but also to promote the game of golf in South Africa, and to assist those less fortunate than ourselves. The Nomads badge was changed to its present format of a bell crossed by a golf club to signify the remembrance of others, through golf. Thirteen Durban golfers under the leadership of Noel Thompson were given the go-ahead to form the Natal club in September 1963. After a somewhat slow start, the Nomads concept gradually caught on and with plenty of encouragement from Transvaal, Natal forged ahead. mikeFlorenceIn the meantime, a certain Louis Immerman in Cape Town, who had heard the Nomads concept, was badgering Mike Florance to let him form a club in the Mother City. Eventually, in 1965, Louis signed up 45 interested golfers and the Western Province Club was formed. With three Nomads clubs in existence, it was only a matter of time before a National Tournament was arranged and this Mike Florance did at Kyalami in 1966. The occasion was so successful and enjoyable that all concerned vowed that it should become an annual event, which it has been ever since. The publicity generated by this and subsequent early Nationals was of great importance to Nomads in that it made the formation of new clubs so much easier. In fact, the staging of the first National Tournament must be regarded as a major turning point in the history of the club. 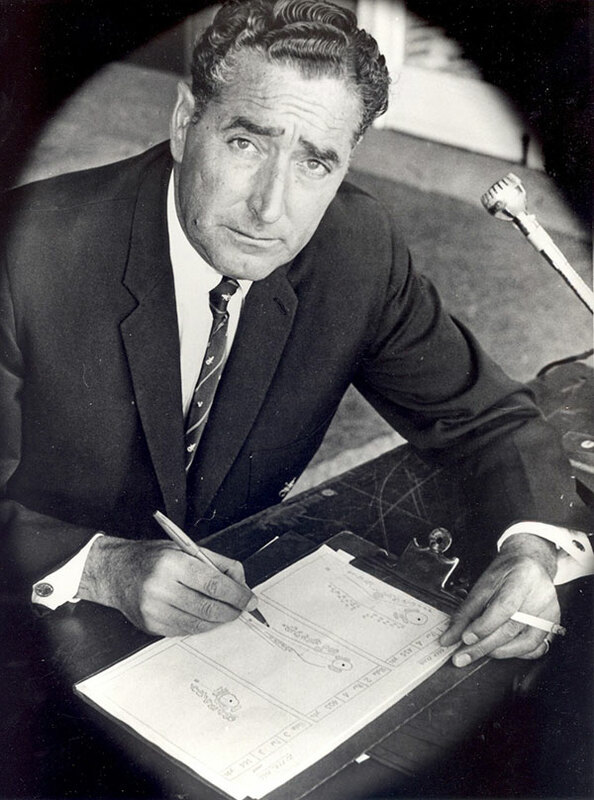 By 1966 the pressure on the Transvaal Club to take in new members was such that it was decided to split the club and let John Thornton and his fellow Pretoria-based members form a new club north of the Jukskei. The Northern Transvaal Club was launched in April 1967 with Mello McRobert as Captain. At this stage it was generally felt that the Nomads Golf Club had reached its peak and that no other centres were large enough to support a club but Brian Norgarb, an ex-Transvaal Nomad, then in Rhodesia, clamoured for the formation of a club in Salisbury. Eventually a ‘Show the Flag’ visit was arranged and in 1969 the Rhodesia Club was launched. In 1971 the Western Province Club felt that the time had come to take a third look at the Eastern Cape and two ‘Show the Flag’ meetings were arranged in Port Elizabeth. Not only did the Nomads have a wonderful time, but a seed was sown which successfully grew into a new club. With the assistance of an enthusiastic steering committee, Dennis Howard was able to arrange the Eastern Cape Club launch in October 1972. In 1974, half-way through his term as the second captain of Eastern Cape, Joss Hamilton was transferred to East London where he immediately set about organising the formation of a Border Club. It was inaugurated with 90 Founder Members in July 1975. While the coastal development was taking place, expansion into huge golfing population on the Reef was baulked by the virtually static membership of the Transvaal Club and something had to give. With a number of Transvaal members switching over with him, Bill Moseley got the new Eastern Transvaal Club going in June 1978, thus creating the space needed for the new blood in the Transvaal Club. The next move was rather saddening. With the political transition of Rhodesia to Zimbabwe, Nomads from north of the Limpopo were forbidden to fraternise with South Africans and the 1980 National Tournament in East London was the last in which they participated. However, being isolated made them look inward. The old Rhodesia Club first became the Zimbabwe Club and then it became the Mashonaland Nomads Club, when, in 1984, the Matabeleland Club was formed in Bulawayo. A third Zimbabwe club, Midlands, centred in what was Gwelo (Gweru), followed in 1986. Zimbabwe Nomads now has its own National Executive and National Tournament and, with the reinstatement of relations in 1992, both countries’ clubs send a combined team to each other’s National Tournaments. Although it was some time before any more clubs were established, it was not for a lack of trying. One group was working in the Southern Cape and the Southern Natal. The Southern Natal group had the advantage of a number of up-country Nomads retiring to their part of the world. The two Gillies, Sales and Richardson, eventually got their club off the ground in February 1984 under the captaincy of the latter. Southern Cape was not as easy but after a couple of false starts Jan de Kock finally got them going at a never-to-be-forgotten Seaboard Trophy meeting in Oudtshoorn in June 1985. Within a few years of its formation in 1965, Western Province closed its membership and remained closed, off and on, through the years. The members knew that they should do something about it, but when? A measure of the pressure which had built up can be gauged from the fact that when the Boland Club was eventually launched by Bones Nagel in January 1993, they had 180 Founder Members and the membership was immediately closed! Because of the renaming and changing of the provincial boundaries prior to the General Election of 1994 it was decided that, in line with their respective Golf Unions, the Transvaal, the Northern Transvaal and Eastern Transvaal Clubs would change their names to Gauteng, Northerns and Easterns respectively. By the early 1970s Transvaal Nomads were making regular tours to the Lowveld to the extent that it had become one of the most popular outings. However, whenever discussions turned to the viability of the formation of a Nomads club in the Lowveld the issue was never pursued because the concept flew against all the Nomad norms. These norms were that a club had to have a reasonably large number of founder members to sustain it; and members should not be required to travel too great a distance to participate in monthly meetings. Eastern Transvaal, though, had different ideas. Shortly after their formation in 1978 they, too, started undertaking ‘away tours’ to the Lowveld. As time went by the idea grew that a new club could be formed and at an historic meeting of the National Executive in 1994, Dave Tod who was then Captain of Eastern Transvaal, proposed that the formation of a club in the Lowveld be investigated. A ‘Show the Flag’ meeting was held in Nelspruit in 1995. This was a radical departure from the Nomads custom in that the number of founders would be considerably below that of the norm then deemed necessary for the successful functioning of a club; the club would rely on the hospitality of golf clubs, the majority of which were only 9-hole courses; and it would involve the members in a greater degree of travelling to courses than was considered normal at the time. Nevertheless, in the wake of considerable perseverance, persuasion and close liaison amongst the National Executive and the other parties, the Lowveld Club was officially inaugurated on 17 November, 1996 at a meeting held at the Nelspruit Golf Club. Over the years a number of Nomads were transferred to, or moved to, the Free State. 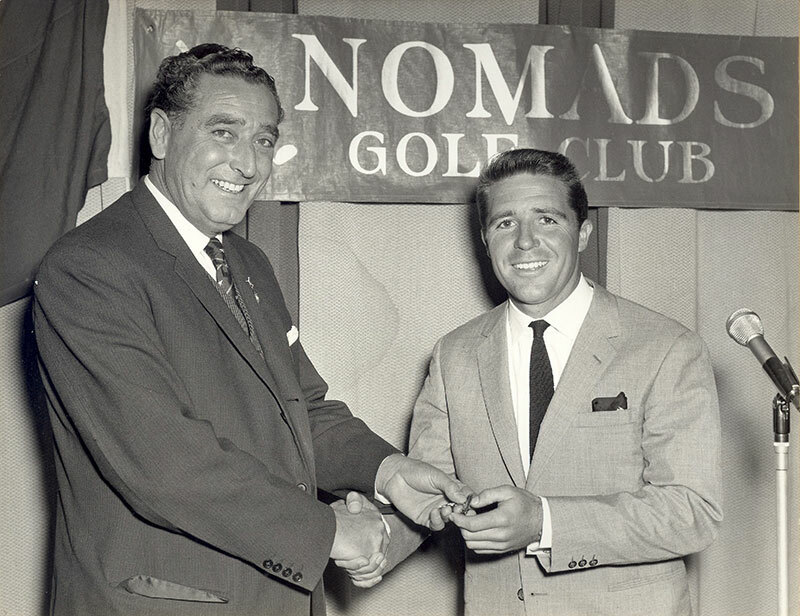 Following an unsuccessful attempt to start a club in May 1996, no less a person than the president of the Free State Golf Union invited the Nomads National Chairman, Neale Kunhardt, to address a small gathering of interested golfers at the Bloemfontein Golf Club. This was followed in August by a ‘Show the Flag’ meeting at the same club after which sufficient interest shown to warrant the election of a steering committee consisting of three ex-Nomads and an Associate Member, to assess potential support from both golfers and clubs. A major problem was the distance between centres but the enthusiasm of the steering committee members more than compensated for this. They were assisted greatly by several more informal games supported by Nomads from other centres. In August 1997 the National Management Committee gave the Boland Nomads Club the go-ahead to oversee the formation of the Free State Club with Herman Braam, the leader of the Free State steering committee, as Captain. The Free State Nomads Golf Club was inaugurated in great style at the Bloemfontein Golf Club on Sunday, 9 November, 1997. In 1996 the National Executive was approached by an ex-Southern Natal Nomad, Lisle Thackwray, asking for approval of, and assistance towards, the start-up of a club in Auckland, New Zealand. Both were readily given and the club started its career in August 1997. Their equivalent to the Gary Player Knockout competition is under the patronage of Bob Charles. Meanwhile, sometime in 1993, a group of golfers in Gabarone, Botswana, calling themselves ‘Gomads’ started playing Nomads style games once a month on a Thursday. They applied to the National Executive for permission to become Nomads. Since they only have one 18-hole course and are in another country they were granted Independent status and were inaugurated under their Founder Captain, Julian Harris, on Thursday, 5 February, 1998. A number of representatives of the Botswana Nomads Club were invited to attend both South Africa and Zimbabwe National Tournaments, and inter-club games began to be held annually between South Africa and Botswana. Then, in 2003, the National Executive was approached by another ex-Southern Natal Nomad, Wayne Richardson, asking for approval for, and assistance towards, the start-up of a club in Sydney, Australia. Both were readily given and the Sydney Club started its career late in 2003. A second club, Sydney Hills, was formed in 2005. This gave rise to the original club becoming known as Sydney North. Regrettably, the initial enthusiasm shown by the Sydney Hills Club was not sustained and its members reincorporated into the original Sydney Club. Following his transfer to the Gold Coast, Wayne was active in setting up a new club in Brisbane which was inaugurated in July 2008. The first Australian Nomads National Tournament was held in October 2009.
fifty-anniversaryOver 50 years on and with a club bursting with enthusiasm and vitality, further expansion was just a matter of time. In 2011 the Nomads UK Golf Club was inaugurated with Swaziland following suit in 2012. In 2013 New Zealand and Australia were actively pursuing the potential formation of other Nomads clubs in their major centres and now in 2014, Mauritius has formally requested authority from the National Executive to pursue their dream of a Nomads club on the island. It seems the world has a thirst for Nomads!